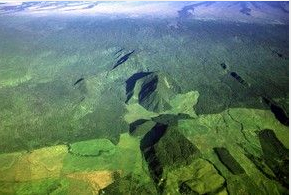 BY TOM LODGE – It is interesting that the Department of Health Office of Environmental Quality Control signed off on the Kau Forest Alala Reserve with a “no significant impact” assessment. Was there any other possibility? I’m not certain, but these plans are usually agreed to in advance then taken to the street to be sold to the public. It is on the finding of this assessment that I comment. Cant make everybody happy all the time but this management plan tried to do so. plenty of room for everyone. My voice shouldn't matter so much though- I'm not from Ka'u. Here's where I disagree with some fencing plans when they start to conflict with popular hunting grounds and get into areas that are less native: It doesn't have to be no animals VS plenty. We need game management plans that foster healthy game production systems that account for habitat quality. A 75% reduction in game can do wonders to impacted vegetation (both native and non-native including those considered invasive) and recreational hunting could easily accomplish this if the same ammount of money was put towards it and rules were lifted in certain areas (NOT SAYING ALL PLACES). When game is below carrying capacity, forage improves, and remaining animals become healthier and better eating. Imagine a network of trails, shelter, and smokehouses deep in the forest, not only used by hunters but by everybody who enjoys the forest. Increase access, increase fun, increase incentives, good for native ecosystems. Improve the outdoor experience! Die-hard advocates of fencing dont consider public hunting capable of reducing animals enough to save native species, and they cite examples where it supposedly failed to meet their criteria for what is successful. Hi Nic…. management is what you probably are referring here… actively sending people out into the forests areas or other impact areas and making periodic assesments as to what needs to be done… in Hunter Education, you have a Wildlife Conservation Triangle that the DLNR promotes for their students… Research, Management, and Enforcement. This would be welcome Research… but alas, its not in evidence anywhere in Hawaii. Rain follows the forest is flawed in many ways. For one thing, the amount of water that naturally flows into the ocean each day on the Big Island, is probably close to 6 months use of actual water resources. Kau Forest Alala Reserve it is very nice place.